As you drive this straight road known as Highway 3 through Southern Alberta, Canada you will see farmland on either side of the road for miles. 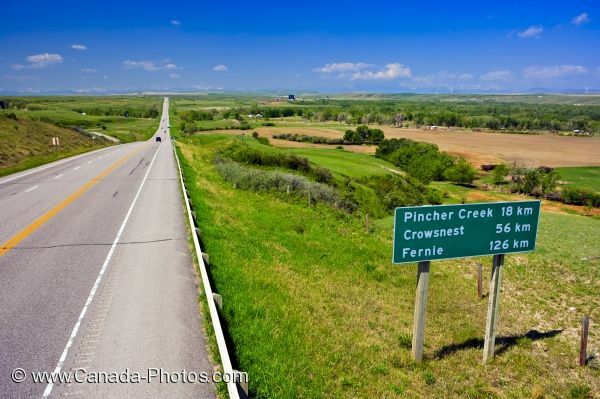 The prairie countryside seems to extend forever but the sign lets you know you only have eighteen kilometers until you reach the town of Pincher Creek and not far from there the next town is Crowsnest. Highway 3 road and the southern Alberta Prairies, Southern Alberta, Alberta, Canada. Picture of the road near Pincher Creek, Alberta surrounded by prairie farmland and farmhouses.